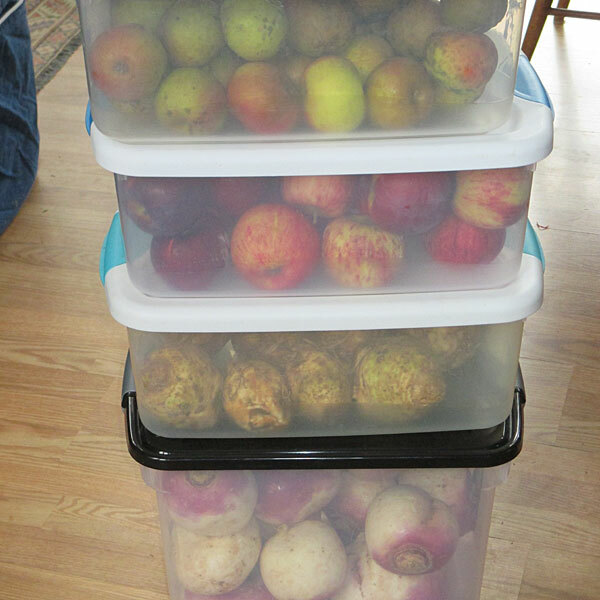 A recent “shopping” expedition to my root cellar highlighted the joys of our long and cold winter. Traditionally in April, my root vegetables are starting to sprout in anticipation of warmer days. Unless they have been well tended, the rutabagas, celeriac and turnips have various degrees of rot and mold. When popping open the tubs of green and red cabbages, I was delighted to find firm, compact heads with minimal decline. The dense, solid, blue-green cruciferous vegetables grown by Gene and Mary Margaret Ripley were a work of art! The cabbage variety, Storage Number Four, was perfectly suited for my long-term storage of late October until April. The leaves were still crisp, the inside solid, and the taste delicious. Cabbage tends to be an underutilized vegetable in our family. We usually enjoy it as part of a boiled dinner, and grated into slaws. Inspired by this tender and sweet bounty, I turned to Deborah Madison’s “Vegetarian Cooking for Everyone” for a creative preparation. The recipe for Cabbage with Cider & Mustard Cream Sauce makes an outstanding side dish. I made a large batch, which transported easily to a potluck supper for beginning farmers. Madison also recommends serving it over noodles for a complete meal. Although I have yet to try it, this recipe could also be the base for Cabbage-Stuffed Cabbage with Blue Cheese. Blanch and separate eight leaves for stuffing, prepare the cabbage with the sauce, then stuff the leaves with chopped cider and mustard cabbage, and a nugget of blue cheese. The combination of mustard and cider is a perfect foil for the cabbage. The cream mixes with the juices, turning into a thin sauce. Quarter the cabbage, remove the core and cut into wide ribbons or squares. Boil, uncovered, in a large pot of salted water for 4 minutes. Drain, rinse under cool water, and squeeze out the extra moisture with your hands. Melt the butter in a large skillet. Add the chopped leek and cider. Cook over medium heat until tender, about 5 minutes. Add the cabbage, mustard and cream. Cover and cook over low heat until tender, about 10 minutes. Season to taste with sea salt and fresh pepper. Serve as a side dish, or for a complete meal, serve over buckwheat grouts (kasha) or egg noodles. Nutritional analysis per serving: 106 calories, 2 grams protein, 9 grams carbohydrates, 7 grams fat, 105 mg. sodium, 2 grams fiber. As the snow melts and the ground begins to thaw, we’ll be enjoying both red and green cabbages. Cabbage wedges with chopped dill, cabbage with potatoes and brown butter, red cabbage with apples, sweet and sour red cabbage. It’s been a long winter, but because of it, our spring will be blessed with plenty of good eating.